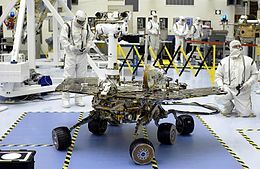 Opportunity, an aa kent as MER-B (Mars Exploration Rover – B) or MER-1, is a robotic rover that wis active on Mars frae 2004 tae 2018. ↑ 1.0 1.1 1.2 Nelson, Jon. "Mars Exploration Rover - Opportunity". NASA. Retrieved February 2, 2014. ↑ 2.0 2.1 "Launch Event Details – When did the Rovers Launch?". Retrieved April 25, 2009. ↑ McDowell, Jonathan (July 15, 2003). "Jonathan's Space Report No. 504". Jonathan's Space Report. Retrieved April 28, 2009. This page wis last eeditit on 18 Februar 2019, at 00:32.